Last week at a meditation facilitated by Anthony Citro (see his website), we were asked to focus on a relationship in our lives that we wanted to heal. At first I expected to focus on my relationship with my boyfriend, or with my parents or friends, but my mind turned to Linda O'Neill, co-founder of the SQ-Foundation, a non-profit charity that does wonderful work around the world. As I became involved in SQ after Linda passed in 2008, I have only gotten to know her through stories and photographs. During the meditation, I imagined her across a dark chasm, smiling at me from a close yet impenetrable distance. How I would love to talk to talk to her, to hear her story, to learn from her how to become a better person. My mind turned to other friends and family who have passed: my grandmother Katherine Kilgore and her best friend and my "adopted grandmother," Suzanne Vogel. How much we can learn from these wise women! How I wish I could talk to them now in person! 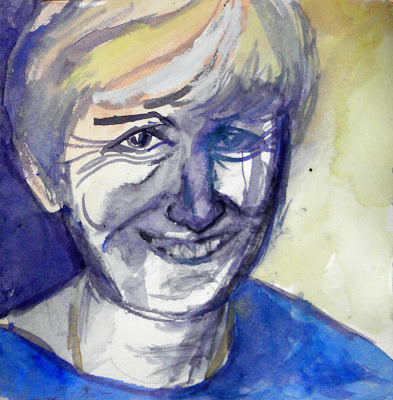 In this watercolor, Linda's face is partially obscured, as if behind a veil, symbolizing how loved ones live in our memories after they have passed.